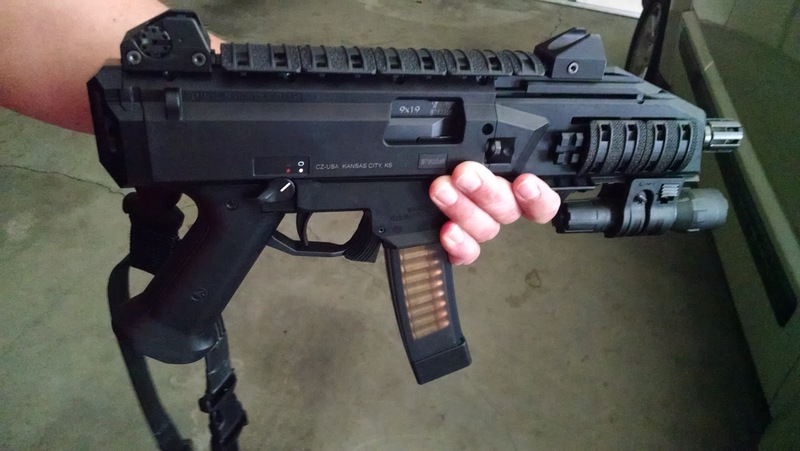 I bought a CZ P-07 Duty pistol in 9mm back in July or August of 2014. That was kind of like my first step into getting back into guns. I went to the range with Trizz a bunch of times, and quickly developed a deep and passionate love affair with CZ stuff in general. 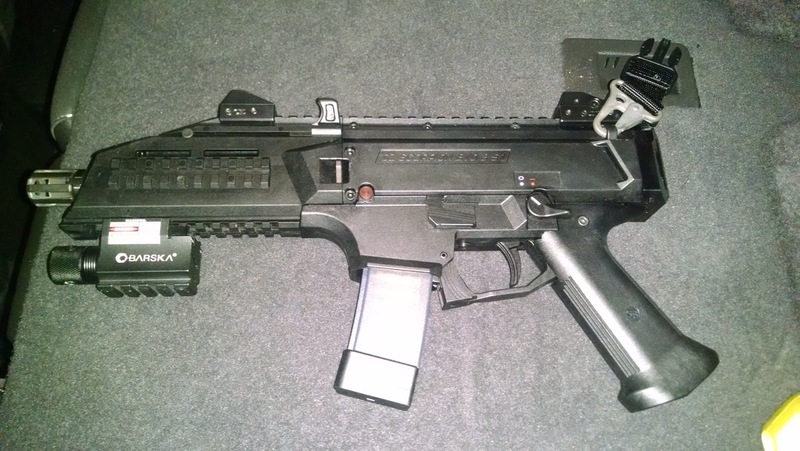 Just before the plant shutdown around Christmas of 2014, The EPO were killing time playing around on the internet at the office looking at guns and whatnot when I ran across the Law Enforcement section of the CZ-USA site and saw the Scorpion Evo 3 A1 as well as their Bren gun. I told Trizz, "Man, if they ever make a civilian version of that gun, I'm all over it!" Little did I know, they probably already had. How in the world I didn't know about this when it actually dropped I still don't quite understand, but at some point in early 2015 I became aware of the Evo 3 S1. The following July, I had one in my possession. I love the looks of the weapon and after putting a couple thousand rounds through it and getting used to it, it's my "bump in the night" gun now. It's accurate out to 100 yards (and then some probably, but that's as far as I've ever shot it and tried to hit anything) due to the nearly 7 3/4" barrel which also ballistically makes it hit more like a .357 than a 9mm. 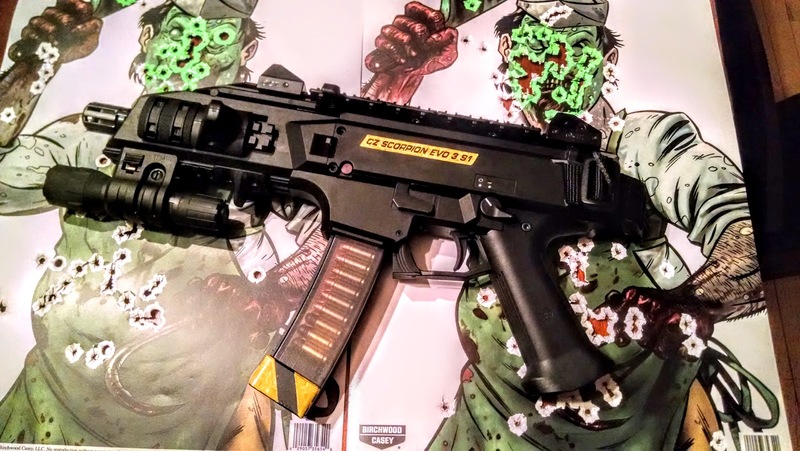 It's affordable to shoot as 9mm is pretty cheap, and you can use all kinds of the self-defense offerings (Hornady FTX flavors, JHPs, Hydra-Shocks, whatever) as there's tons of that stuff floating around in 9mm. Hell, I even ran Firefly tracers through it without issue in our Couch video. 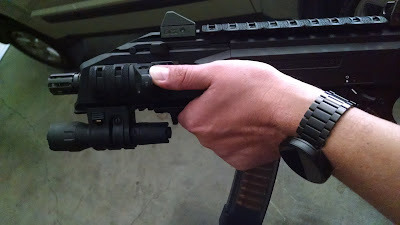 If you're into that kind of thing, CZ makes adapters that allow you to add an AR stock, the Sig brace, or just a buffer tube that will allow you to get a cheek weld (or mount a blade). Me personally, I dig it the way that it is. I wear a single point Blackhawk strap with it and some hand stops on the forward integrated rails and feel like that's good enough. Your mileage may vary, but I like having the ability to swing around such a small weapon. Obviously I'm not SWAT or whatever, but if I were clearing a house or something, I'd appreciate the ability to point this thing where I wanted rather than wrestling around with a stock. I'm not saying I'll never SBR it if CZ puts out their 922(r) compliance kit, but I'm pretty happy with the way it's set up currently. The Scorpion S3 is built virtually the same way as the A1 (the automatic version European cops and military use), so it's rugged and has a massive bolt. I don't worry about it jamming or failing to extract because it's such a robust platform that's been extensively tested by folks a lot tougher than me for years. The main complaint with this pistol is the trigger and I'll be honest with you, it is pretty heavy. That said, it does break in somewhat and there are lots of YouTube videos about polishing and modifying the springs and whatnot. Me personally, I'm holding out for Cajun Gun Works to release their parts as those dudes are like the masters of all things CZ. The trigger ain't great, but it's not quite as bad as the internet might make you believe. It's definitely usable, but it isn't light. With the integrated rails, you can attach all kinds of fun stuff to it. 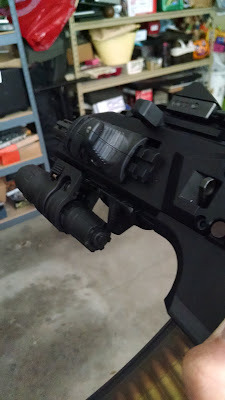 I experimented around quite a bit with it and currently I'm stuck on the red dot sight up top, finger and thumb stops, and flashlight beneath the muzzle. Folks seem to either love or hate the idea of pistol caliber carbines. Obviously I'm one of the guys who likes the idea, so I'm not going to debate the advantages and disadvantages of this kind of platform. Like most things gun-related, personal preference is going to trump just about any debate one can produce. Suffice it to say, if I end up in an extended power outage, I'd like to have something that's a bit of an all-arounder so I don't have to carry as much stuff around and that's the role I feel the Scorpion fills (for me at least)- it's accurate at urban engagement distances, is highly maneuverable, easy to clean and maintain, has reasonably priced 30 round mags, and with all the different 9mm rounds available, mitigating traditional 9mm shortcomings like overpenetration become less of an issue. I'm also pretty sure I won't go permanently deaf if I have to shoot it indoors at some point. I'm not sure if the AK and AR pistol guys could make that claim. Anyway, hope you dig it! It's a whole lotta fun! Labels: CZ Scorpion Evo 3 S1, Guns!